The magician presents a white CD and a black box. The CD is put into the box and one of 3 colored ribbons is thread through the center of the box and the CD inside. 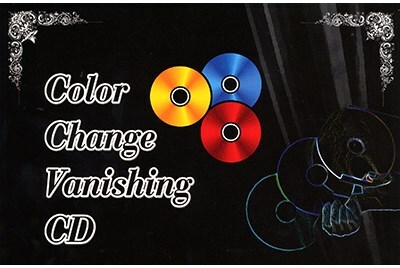 The CD is removed from the box bringing the ribbon with it in it's center, but the CD has changed color to match the ribbon! The magician repeats this 2 more time with the remaining white CDs and colored ribbons. Once all 3 CDs have changed color the box is opened proving it is empty! CDs and instruction sheet in English and Korean.